Thirty-one days after President Umaru Musa Yar'Adua's departure from Nigeria for medical treatment in Saudi Arabia, former heads of state have scheduled a meeting for next week to discuss the state of the nation. THISDAY learnt that the meeting, which may hold in Abuja, will be attended by Gen. Yakubu Gowon, who was head of state between 1966 and 1975, Alhaji Shehu Shagari, civilian president between 1979 and 1983, ex-President Olusegun Obasanjo who ruled as military head of state from 1976 to 1979 and as civilian president from 1999 to 2007, and Gen. Abdulsalami Abubakar, who ruled the country from 1998 to 1999. It was not clear last night if Gen. Muhammadu Buhari and General Ibrahim Babangida will be part of the meeting. Sources close to Buhari, who ruled from 1983 to 1985, told THISDAY last night that he was yet to be invited. “I know there are moves being made but I can confirm that he (Buhari) has not been invited yet and I can assure you he will not invite himself to the meeting,” the source said. Babangida, who ruled from 1985 to 1993, is currently in the United States following the ill-health of his wife, Maryam. The details of the agenda of the meeting were not very clear, but THISDAY learnt that the meeting is principally on the current political situation in the country arising from the President's medical condition, which has kept him out of the country since November 23. The former heads of state, who are members of the National Council of State – an advisory body which meetings are usually convened by the President – are set to look at the issues surrounding the President's failure to write a letter to the National Assembly to inform them of his absence from office, a situation that has not allowed Vice-President Goodluck Jonathan to assume the role of Acting President in line with Section 145 of the 1999 Constitution. After the meeting, THISDAY learnt, the former heads of state will hold a meeting with Jonathan to offer him counsel and inform him of their position on the issues occasioned by the current situation in Aso Rock. Various groups, including the Arewa Consultative Forum (ACF), have declared that the constitution must be followed in the event of a vacancy in the office of president, meaning the Vice-President should be sworn. This contrasts sharply with the position of the Northern Union, led by Dr. Olusola Saraki, which said recently that constitutionalism should be sacrificed for political expediency – suggesting that a Northerner should be allowed to complete Yar'Adua's tenure since a Southerner (Obasanjo) had ruled for eight years in line with the power rotation arrangement of the ruling Peoples Democratic Party (PDP). The former heads of state are expected to deliberate on the issue and the way forward. Buhari has already made his position public – that the constitution must be followed in case of any eventuality. Yar'Adua had been flown to the King Faisal Specialist Hospital and Research Centre, Jeddah, Saudi Arabia, on a medical emergency on November 23. The Chief Physician to the President, Dr. Salisu Banye, had said in a statement that the President was being treated for Acute Pericarditis – an inflammatory condition of the covering of the heart. 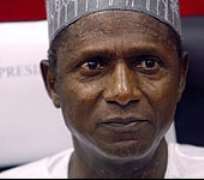 His four-paragraph statement read: “At about 3pm on Friday, November 20th, after he returned from the Abuja Central Mosque where he performed the Juma'at prayers, President Umaru Musa Yar'Adua complained of left sided severe chest pain.